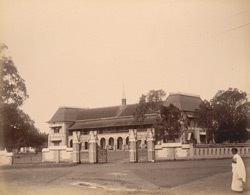 Photograph taken about 1900 by the Government photographer, Zacharias D'Cruz of what is now called the University College at Trivandrum, during Lord Curzon's visit to the Travancore State. It is one of 76 prints in an album entitled 'Album of South Indian Views' of the Curzon Collection. George Nathaniel Curzon was Under Secretary of State at the Foreign Office between 1895-98 and Viceroy of India between 1898-1905. The building was completed and occupied in 1873 with John Ross of the Edinburgh University as Principal. When the B. A. classes were opened there was provision to texch only one Optional Branch, viz., Philosophy. Another branch , Mathematics and Natural Philosophy was added in 1879. A chair of advanced chemistry was established in 1884, and another for History in 1900.